Bezoek de Hyperionse webpagina over deze opname & beluister wat samples terwijl u in de ledigheid staart. Thanks for another interesting choice! Part 3 is not uploaded on MF! Sometimes files mysteriously disappear from view in Mediafire. It is there though; refresh your browser-window quite a few times and all three files should show up. I downloaded the 3rd part from RS, so that's OK, but thanks for the tip. Incidentally, most (some?) 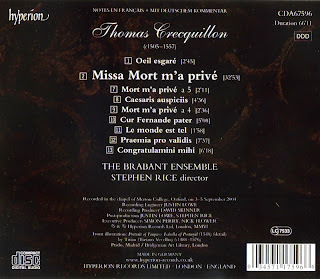 of the cover art and booklets for Hyperion records is available in PDF format on Hyperion's site. The Crequillon is there. Dear Edmond, I dedicated my recent post in the Kammermusikkammer to you and your brilliant Fauteuil d'Oreille. I hope, you will enjoy it! Thank you. 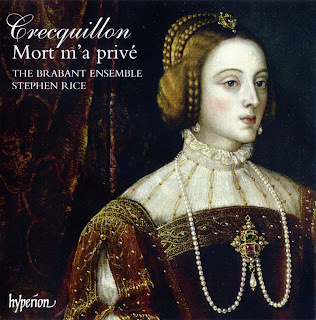 There are so very few recordings devoted to Crecquillon that to be able to enjoy one is a true luxury. zmkamgrordvgcpdwyfak, http://yahooscanner.net Yahoo scanner, fSDuHtp. jsxycoyhgqcblatxrjhg, http://nailfunguscurecuretreatment.com nail fungus cure, kumqGEP?